New York and New Paltz area residents, come on by! Poster by Videofreex member Bart Friedman, featuring an illustration of member Nancy Cain. 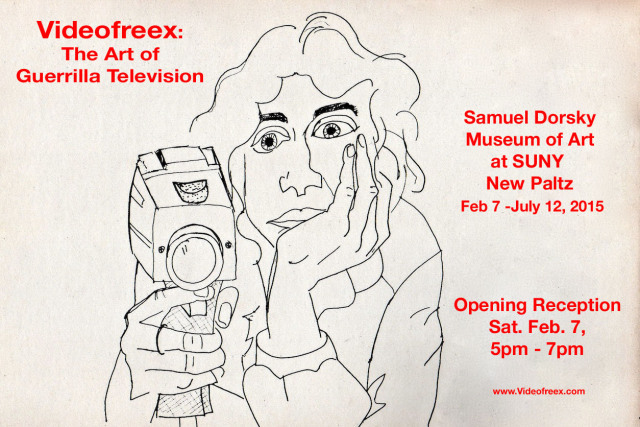 Just one week from today, on Saturday, February 7, the Videofreex exhibit opens at The Dorsky. That day, members of the Videofreex will come from New York, California, and D.C. (that’s me!) for the opening reception. Skip is driving up in what he’s dubbed the Videofreex Mini Media Bus. Join us at the Samuel Dorsky Museum of Art on the SUNY New Paltz campus in New Paltz, NY.